How do failed payments work? All PayWhirl accounts come with tools to help you manage failed payments (aka dunning) and automate your collection processes. Failed payments are inevitable in the world of ecommerce and especially prominent for recurring types of payments like subscriptions. For this reason, all PayWhirl accounts come with tools to help you manage failed payments (aka dunning). The first step is prevention! You can enable the "payment reminder" email in your account to help remind customers of their upcoming payment. PayWhirl provides a basic template for all of our emails but we recommend customizing your email templates to match your branding and voice if possible. If a customer's payment fails you can send them an email with the reason code from your connected payment gateway as to why their payment failed. As with the payment reminder email, make sure to customize this email to ensure it makes sense for your business needs. You can also send a copy of these emails to your own email address or another person, regardless if they are sent to the customer from the email settings page in your account. Note: By default all failed payments will be retried 3 times, each 7 days apart. You can also set the number of retries before the subscription is cancelled. When a payment fails you can view the related invoice to see the current status, number of attempts thus far and when the next automatic retry will process. 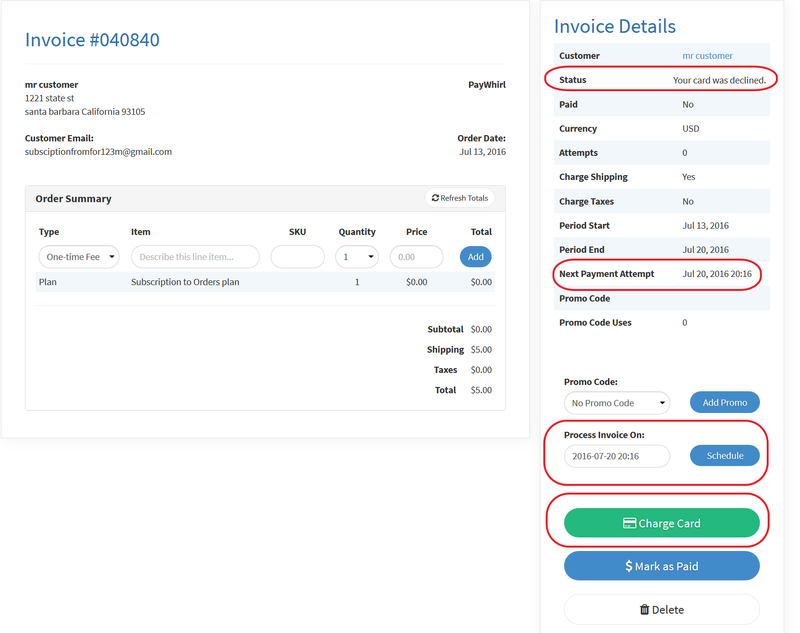 You can also edit the "Process Invoice On" date to another date in the future and/or retry the failed invoice instantly. Other invoice options include the ability to apply additional discounts or late charges, as line items, as needed. Occasionally, after a failed payment a customer will sign up to the subscription plan again, rather than settling their open invoice. When the automatic retry of the original subscription processes, the customer will get charged again, in duplicate. If this happens you can always refund the payment and correct the problem by deleting the new or old subscription(s). How do I refund customer payments? If you have any questions about failed payments, dunning and/or reprocessing failed invoices on PayWhirl please let us know.